Are you looking for somewhere inspiring to hold a corporate day out? Are you looking for some new ways to motivate your colleagues? Are you looking for somewhere that you can really let your hair down and learn some outdoor activity skills? Look no further than Cobnor Activities Centre. We can offer alternative, affordable meeting space with, or without, catering services. 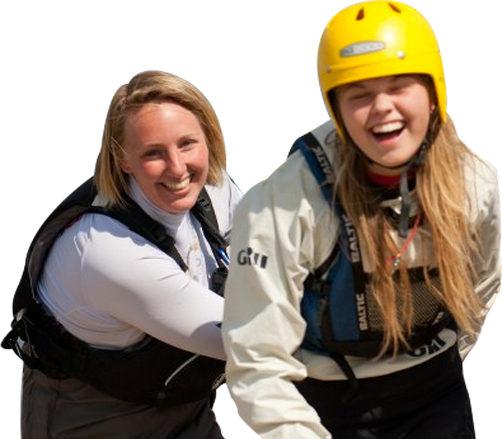 Cobnor Activities Centre does not just cater for schools and youth groups; it also offers multi-activity days for corporate groups of all ages and abilities. We are situated in Chichester Harbour, which lends itself to the range of outdoor activities we have on offer to our corporate clients. Our picturesque location is also ideal if all that you want to do is escape from it all. We have barbeque facilities and can supply full catering for your corporate day on request. Residential facilities are available in our Log Cabin, which sleeps 40 and our Jubilee Building, which sleeps 18. Camping is also an option for those who want the full outdoors experience. If you cannot quite leave the office behind, do not worry because Cobnor Activities Centre also has large meeting rooms with WiFi access, a big screen for presentations as well as tea and coffee making facilities. To find out more or to book your corporate day and team-building activities, please contact us. "I just wanted to say thank you to all involved in our fantastic day spent at Cobnor today. What a wonderful programme you put together for us. It was extremely well organised, and the lunch on the beach was superb. What a great way to spend a day and team build with your colleagues at the same time. Big thanks goes to our powerboat driver Owen, as he went out of his way to help us with our challenges (not giving us any answers though!!! ), and it resulted in us winning!!! What a bonus and a great end to the whole experience. Thanks to you all." We have our specially designed Low Ropes Course as well as other apparatus such as our Spider’s Web and See-Saw. With a large selection of challenges and games for all ages and abilities our staff will make sure you get the most out of your session. Please contact us for more information or to make a booking enquiry. We have three classrooms that are available to hire to complement your team building day. These can be used for day or evening sessions and vary in size according to the number of people in your group. Our Martin Beale building has ladies and gentlemen's showers, toilets and changing rooms, as well as an upstairs classroom with overhead projector and IT facilities. Our Jubilee building overlooks beautiful Chichester Harbour and can be used for meetings to support your team-building day. There is also a terrace which makes an excellent location for barbecues to finish off the day with a flourish.